When we arrived the line up to the palace was massive. 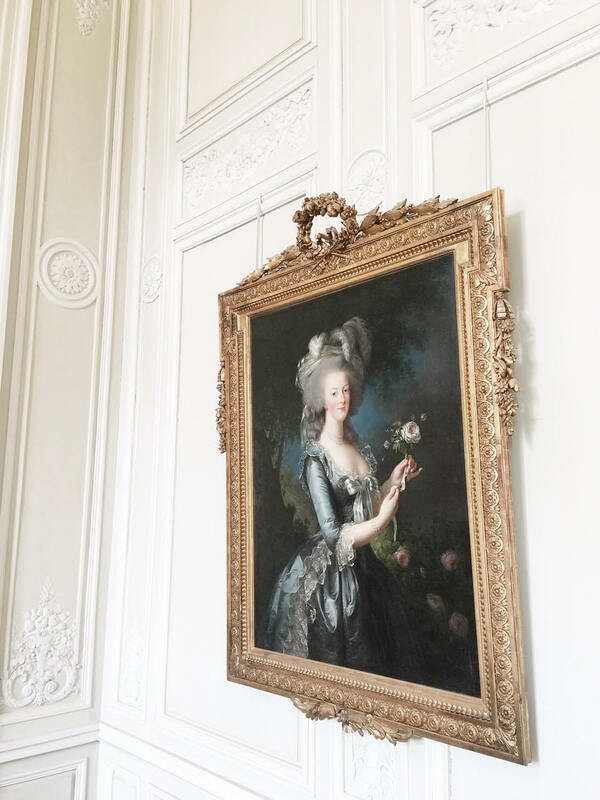 We decided to go around the palace and take the little train to Marie Antoinette's estate and tour there first. Versailles' grounds are infinite (covering 30,000+ acres and including 400 sculptures and 1400 fountains) so there are little trains that you can ride to take you around the estate. The Petit Trianon and the grounds surrounding it reminded me of Pemberley from Pride and Prejudice. 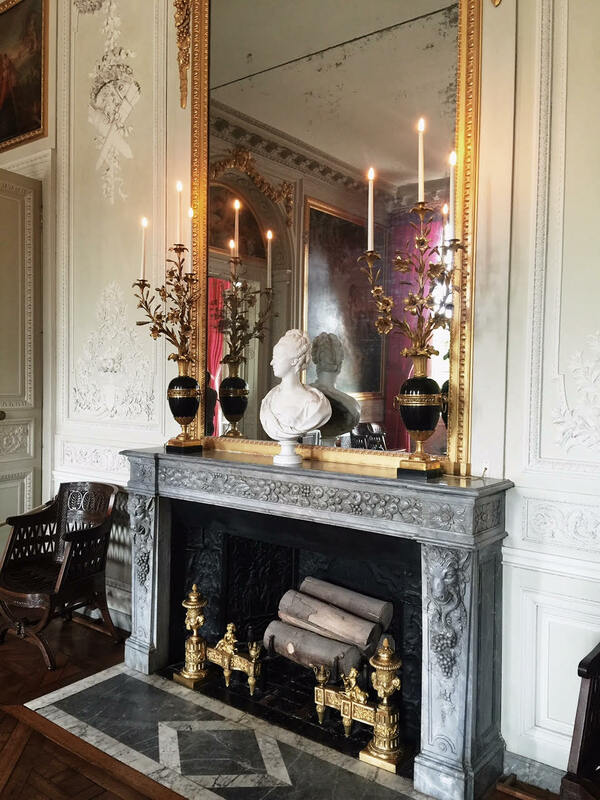 This home was given to Marie Antoinette by her husband, King Louis XVI, and it became her favorite place to stay. Marie Antoinette's bedroom was so grand but quaint. I couldn't get over how tiny the beds were! The details everywhere you looked were absolutely stunning. One of my favorite moments of the day was strolling the gardens around the home. They seemed to go on for miles and miles! So peaceful and serene. After touring the house and the gardens, J and I grabbed some lunch at a cafe onsite. Coming from the garden, apparently a bee hitched a ride on my shirt and when trying to place my order the guy tried to calmly tell me there was a bee on me. I tried not to freak out too much and there was a kind lady in line who came to my rescue and slowly pulled it off me with her brochure. Whew. Pretty funny. Josh attributed it to a few wildflowers I had collected on the way. Ooops. After lunch, we took the little train to the Grand Trianon. Many French royalties lived here including Napoleon Bonaparte. Napoleon renovated the room above into an Officer's Room, and Louis-Philippe had it fitted out as a billiards room for his sons. In 1810, Napoleon used the room above as a library and the adjoining rooms as his small apartment. In the center of the room sits his desk. After the first World War, it was in this very room on June 4th, 1920, that the peace treaty with Hungary was signed. We saved the Palace and the gardens for last and I am so glad we did. If you ever visit I definitely recommend touring the estate that way. There was less of a crowd later in the afternoon and we were able to see the Palace a lot more enjoyably. Oh my gosh, ya'll. The gardens blew my mind away! They were so intricate and detailed. There were people planting flowers and manicuring the lawn as we walked around. It was amazing! The rooftops outside the Palace. The foyer entering the palace was absolutely breath-taking!!! This glorious sight is the two-story Royal Chapel. The ground floor was where the congregation gathered while the upper level was reserved for the King, Royal Family, and important members of the Court. We walked upstairs and were instantly met with this view. Amazing! This room was called the Hercules Room and was the Palace Ballroom. The ceiling (shown below) is the largest painting on canvas ceiling in Europe. The Hall of Mirrors was exquisite.It was here that the end of World War I was officially ended in 1919 with the signing of the Treaty of Versailles. The masked ball for the wedding of Marie Antoinette was also held in this room. This was the bedchamber of King Louis XIV. Versailles was an experience I'll never forget and I am so glad we were able to have. Such an incredible place with so much history. Hope you enjoyed my little tour! The photos are gorgeous and you two look so cute together! My Mom and I are planning a trip to France next summer...I just can't wait! Oh my goodness... I LOVE your blog. Your photos are so dreamy!! Thank you so so much! You are very kind. I'm loving yours as well!